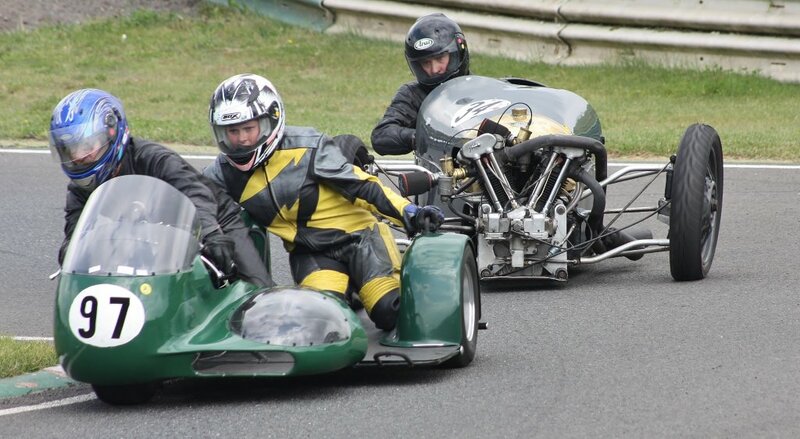 Cracking weather, some cracking racing with thrilling wheel-to-wheel dices which gave us a whole host of new lap records and a clean sweep in the ‘BEARS’ races for Ben Kingham’s flying ‘Brick’– his BMW K100 –with a new lap record of 81.14 mph. But it was not easy, the Trident of Gary Hirons and the Laverda of Austen Kear’s made him work for his victories. 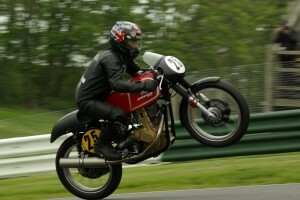 Scott Harris had three wins- two with his Norton and one with the Ducati – and a lap record in the “Over 50’s race. Mike Bevan had a busy and a rewarding weekend with a total of five wins from some stirring encounters. If you mention ‘Bantams’ there are two names that come to mind; One is Ian Scutt and the other is Mike Powel. This weekend was Mike Powell’s with four wins out of five. Ian Scutt had a disappointing weekend with a series of retirements – compensated by victory in the Richard Powell Memorial Race for Bantams held on the Sunday. No BHR meeting would be complete without Mervyn Stratford and his remarkable Rudge’s and this weekend was no exception. A lap record and a win on Sunday Morning to start the weekend followed by a thrilling race-long wheel-to-wheel dice with Graham Buller in the Palletforce Championship Race and overall victory in the Pre-1973 ‘Specials’ race on Monday – which gave him the “Economy Appliances” Championship win. Scooters always give us value for our money and the spectacle of a tightly packed howling horde descending on Gerrards at the drop of the flag cannot fail to excite. When the smoke has cleared, it was invariably the Lambretta of Joe Ravenscoft at the head of the field, but was never easy as Stuart Day and Michael Bonett were never far behind and the mid-field scraps really grabbed your attention. The ‘Zips’ races were equally exciting with Scott Chapman and his PSN Runner keeping a determined pack at bay throughout the weekend. The fastest race of the weekend was the Bob Newby Racing Championship which gave victory and the weekend’s fastest lap of 81.19 mph to Ian Carter on his Seeley G50. Sidecars and three-wheelers seem to like Mallory Park. They turn out in pleasing numbers and their gyrations always entertain. There is no real substitute for ‘cubes’ and outfits so equipped are at an advantage. 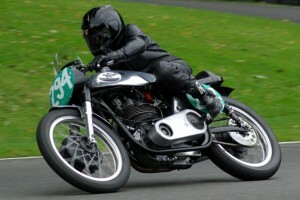 It doesn’t deter as spirited encounters occurred in every race with the fearsome Morgans not having all their own way with Steve Stevenson and his Broadstock BSA giving them a hard time. There’s just time to make those final adjustments and to carry out some fine tuning before the final BHR meeting of the year at everyone’s favourite circuit – Cadwell Park on 28th-29th September.